DeliveryPoD is an off the shelf solution that is perfect for tracking inbound supplies in a Hospital environment. Typically items are received at the Mailroom or Receipt & Distribution Stores at which point the Courier passes responsibility to the Hospital, for the last part of the journey to Wards and Operating Theatres. Even small items can be very expensive, but are very easy to mislay. Some items are time critical—perhaps an item needed for an operation in 2 hours time. In these cases 10 minutes late can have real consequences! Staff resources are scarce in Wards as well as the Mailroom / Goods Receipt areas. 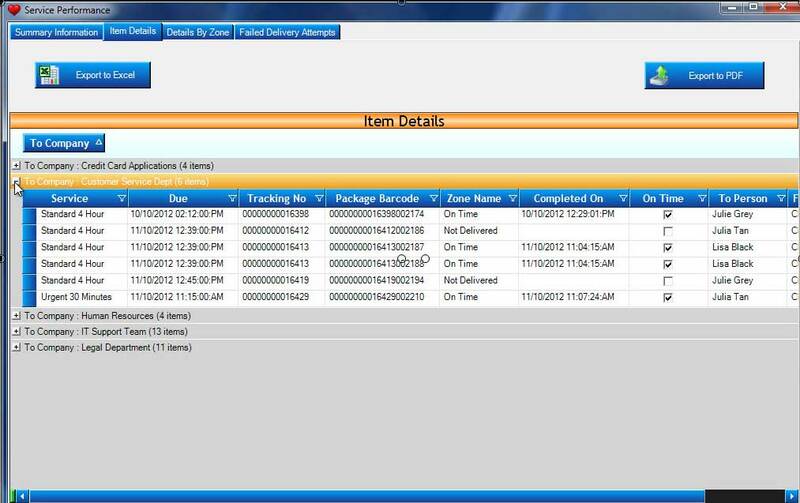 Quickly Record: Courier Track No, Who For, Item Description, Purchase Order etc. Mailroom / Porters can access Searches & Reports from any PC / Laptop. Theatres / Wards can be given access, so their staff can answer their own questions 24/7. Their Logon restricts them to items for them. Set up Email Warnings based upon minutes before / after due time. The system provides a complete audit trail from start to finish. You can set your own Performance Zones to measure KPI’s. For example “Very Early” as being up to 1 hour before due, “Early” as being up to 20 minutes before due, “On Time” as being 19 minutes early to time due, “Late” as being 1 minute to 20 minutes late and “Very Late” as being anything over 20 minutes late. 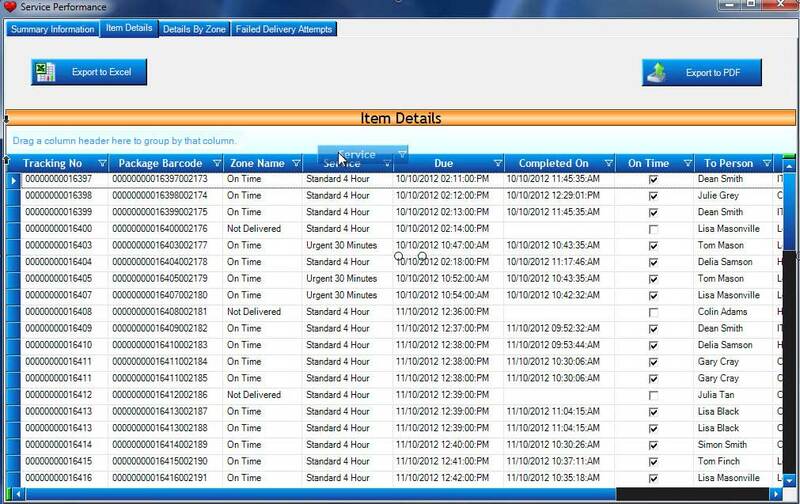 You can then run Service Level Reports Overall, By Department, By Service or any combination you like. You set the time frames you want the results for. 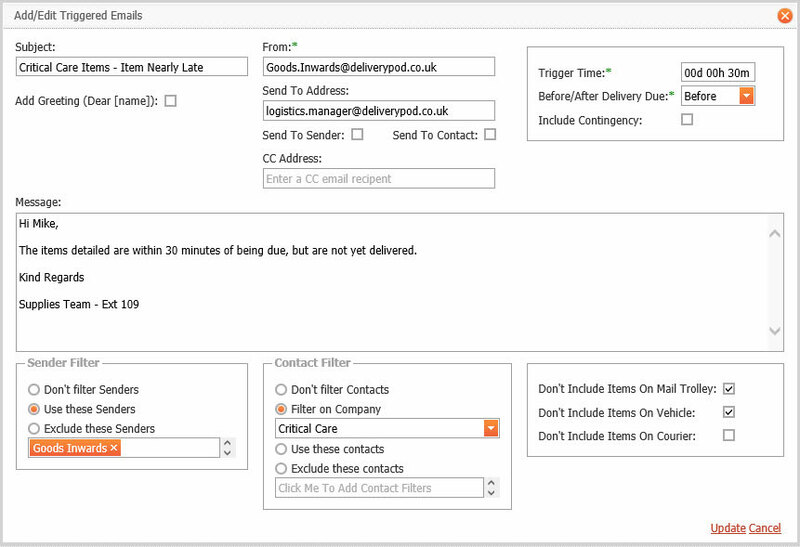 Automatic Email requests can be set up to keep staff aware of issues and progress. · An item is getting near being late, yet has still not been loaded onto a delivery trolley. · A user has noticed a package has been damaged. · Their colleague has signed for their item (just in case they forgot to pass it on). · The team tried to deliver an item, but were unable to (for example the Operating Theatre was shut). · The items have now arrived back at stores. All this is possible and more, saving everyone a lot of time. You can give both Individual Staff and Departments who receive items their own Logons. You would normally restrict them to see only items for just them personally or their department. This is entirely your choice, you do not need to give anyone access at all if you don’t want to. The time saving to both the delivery team and Ward / Theatre staff could be massive. Mobile Computers are used to track your supplies through every step of the process. You can also use the PC / Laptop version of the software to track at desks if you wish as well. Mobile Computers can use a Wireless LAN or Mobile Phone Network (GPRS, 3G etc) to send data automatically to the website, which often arrives just a few seconds later. If out of wireless coverage Tracking Data and Signatures are stored and forwarded when the mobile computer moves back into coverage (or is connected to a cradle). You can simply use desk cradles, in which case Tracking Data and Signatures are stored and sent when the mobile computer is placed in the desk cradle. 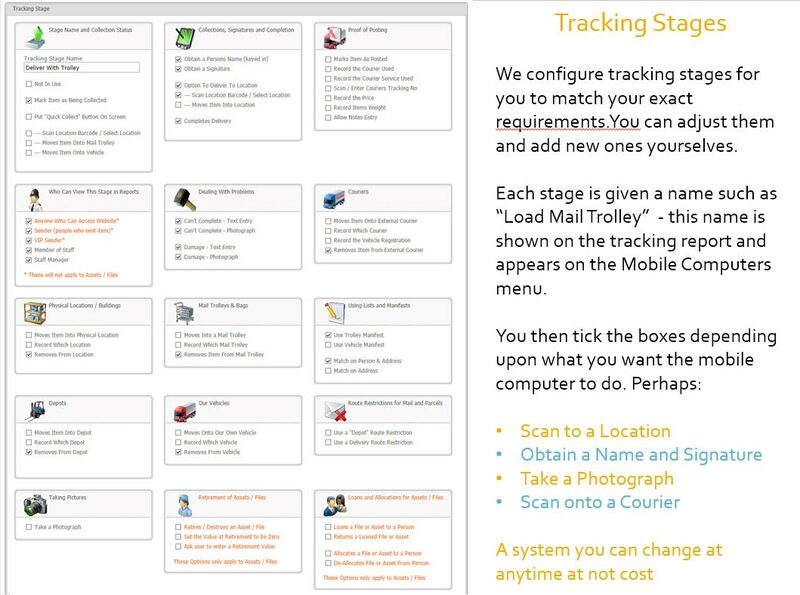 Rather than make every customer work in a fixed way, DeliveryPoD has configurable Tracking Stages. We set these up for you (we ask you a series of questions about how you work), but you can change the Tracking Stages or add new ones yourself at any time. What the mobile computer prompts you to do, when you select the stage from the menu. For example “Damage” and / Or “Can’t Complete” button. There are many other options as DeliveryPoD is extremely comprehensive, however once setup it is incredible easy to use as staff only see what they need to see.